Intention: to blog the Moon through the houses starting with the First House Moon and starting now and to use my chart as an example but being as objective as possible. For example, if you see your Moon traveling through your second house, a way to work in harmony with the Moon’s energy in order to feel … well, to feel harmonious or to be in synch with your emotional nature and in order to enhance happiness, those 2 or 3 days of each month would be a good time put your finances in order. That’s going to be the underlying connection in the psyche’ anyway (2nd house/finances), why not use this knowledge and cooperate with the energy? During the few days each month that the Moon is moving through your seventh house, for example, you will likely be drawn to giving some quality time to your relationship. If you know your relationship partner’s chart, you might imagine just how beneficial it would be know when the Moon is moving through their seventh house too! Timing for scheduling family gatherings, career presentations and many other areas of your life can be enhanced through knowing when the Moon moves through your houses. Even if you don’t schedule an event or activity based on your Moon transit, you can at least understand your own energy patterns and use the map of your chart to know yourself and other people better. Of course, that happens with all the planets and the whole chart too. The Moon is 1 out of 12; but it’s an important one—our feelings of security and happiness are connected to the Moon energy. I love astrology because there’s no other system like it in which we can reap the benefits of consciously working in cooperation with natural forces! These forces are those that are recognized as we begin to awaken and as we really observe our life. 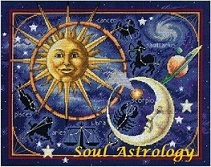 Astrology is a structure that helps us see the order of those forces. Once realized through astrology, we can get in touch with that energy and work in harmony with it instead of struggling against it, enhancing self-understanding, understanding of others… and well… so many other benefits…but mostly we get those types of jaw-dropping types of realizations that enhance the feeling of magic and awe for the universe and divine forces. Getting back to the Moon now… I like to think of the Moon as one giant crystal in the sky that affects our emotions, our heart… our soul. Happiness is an emotion, after all, and so it’s right up the Moon’s legendary alley. I won’t spend many more paragraphs describing the Moon’s archetype assuming you wouldn’t have read this far if you didn’t already have at least a small “feel for” the Moon (pardon the pun). But what about the FIRST HOUSE and when the Moon Moves through it? How does the Moon moving through the FIRST HOUSE area of our life affect our heart, our soul, our feelings, our security and our happiness? I think it’s fair to think of EGO when you think of the first house. We need our ego’s after all and if we give a few days a month to acknowledge it and appease them, well… that doesn’t seem like too much to ask. 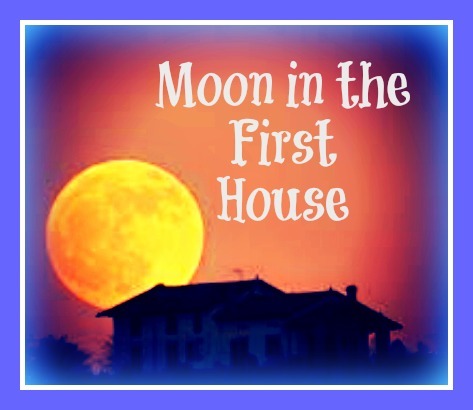 This area of our life relates to the physical body, self-image, physical accomplishments… we’re very aware of how we are seen or viewed when the Moon moves through our firs house. Yet, sometimes we want to keep a mask on and keep people at a distance at this time too and that would be typical. We’re talking about an outward area of our life, our physical issues including appearance, and instinctual behaviors –the Moon is not about thinking, it’s about responding from the heart, the soul, and the emotional center that is triggered resulting in outward physical behaviors. OPTIONAL PARAGRAPH: If a person knows the sign on the cusp of that house as well as any other signs in the first house, this gets blended in or factored in with the core Moon and 1st house Combo energy. Not to mention—but I will—the aspects the Moon makes to other planets and the phase that the Moon itself happens to be in as it moves through first house. All that plays into the outward behaviors that are possible due to the Moon’s transit there. You sort of blend it all into a pot like soup but some chucks are bigger than others but let’s not go there now. I need to keep things simple for this blog—just the house and the Moon are the main course for my purpose here. If you know someone who suddenly wants their space and to keep you at a distance and goes suddenly for a “new look” in their physical appearance, Luna may be moving through their first house. New ‘anything’ relates to the first house and so does freedom and independence. Some things you may want to do when the Moon moves through your first house appearance factors like getting a haircut or a new hairdo or a new outfit—anything that would enhance the appearance to change the self-image would be in line with the energy. Sometimes we need to feel a sense of freedom and have a desire to be alone—Aries, after all, is about freedom and independence and it rules the first house naturally. The first house can be like the first hour of the morning or the first few moments—there’s a feeling of fragility as one comes to this point of awakening and you need space. The spirit here wants unrestrained joy and unrestrained freedom. If there was a time of the month in which we would be rediscovering ourselves and changing our image to match that new discovery, it would be when the Moon transits the first house. Relationships feel more strained at this time—other people may not understand this new image you create or that you suddenly need more freedom to discover and express the next new aspect of yourself in the world. Any needy people in your life are likely to feel disappointed with your energy response to them at this time. There actually are times when to be free and alone is more important than anything else—that would be a Lunar first house time. We need this time to consider our own self-image and possibly try those new changes: a different outfit than you normally wear, new glasses or the new hairdo. But whether you redress yourself in some way or if it’s only a desire to change the physical appearance, you will likely be asking those questions that go along with that kind of thing such as, “Who am I? And What am I doing here? The Moon crossed over into my first house on my daughter’s birthday and I wore my hair down that day (at least partially). Just for the record as it relates to this First House Moon transit, I always wear my hair up in a ponytail. Actually I look different and feel different with the hair down. I purchased a pair of weight lifting gloves (because I was starting to get callouses on my hands from the gym) and while I’m not sure yet how beneficial they are, I notice that this makes me feel more like a more serious exerciser as far as my self-image is concerned. I didn’t think about that connection until just now–i bought the gloves for practical reasons but I think it relates to my current first house lunar transit. I made a blog post about who I am and what I’m doing here when the Moon just entered my first house so that may have also been a lunar effect–CLICK TO READ. I notice that I’ve felt more self-assured as I relate to others these past few days—more than usual which could be part of this whole blend of energy with Mar/Aries being the natural ruler of the first house. The opposite polarity to house 1 is house 7. House 7 is the house of relationships – the opposite house; so one affects the other due to its opposite polarity. Relationships over these past few days have definitely changed the way I am seeing other people as well as myself! If I think of any more personal examples to share that relate to the Moon transiting my first house, I will come back later to add those to this post. But what about your personal moon transit? I hope this post has sparked an interest in astrology and that you may like to continue reading the posts as I go through the remainder of the Moon’s transits through the 12 houses. Your Moon may be in different house right now. You can find out by creating your natal and transit chart on this free chart creation website: www.astro.com . Create a horoscope immediately, as a Guest User or…..
From there you can enter your birth data and then create a transit chart to see what house your Moon is in on any given day! See you again in a few days when my Moon is in my 2nd house for more on the Transiting Moon though the houses and my personal observations.